Mysterious Black Country at the May meeting! The next meeting of the Society takes place on Thursday 9th May at 7:30 pm in St. Andrew’s Church, Bilston Street, Sedgley. The very short Annual General Meeting is followed by a presentation – Black Country Ghosts & Hauntings. The speaker is Andrew Homer a local history author and well known costumed demonstrator at the Black Country Living museum. Andrew enjoys investigating and collecting local ghost stories. Over 150 of the spookiest sites have been published by him and the evening covers a selection from this gazetteer. As usual visitors are invited to come along – cost £2. Sedgley Local History Society [SLHS] is a Black Country group based in the village of Sedgley, which is situated at the northern tip of Dudley Metropolitan Borough and just 3 miles south of the centre of Wolverhampton. Here, the heritage of the Manor of Sedgley, in south Staffordshire, is focused through its nine villages - Sedgley, Gospel End, Cotwall End, Upper Gornal, Lower Gornal, Woodsetton, Coseley, Ettingshall and Brierley. A history of people, places and events. Please contact us if you have any comments, suggestions, contributions or questions. Please note that genealogy isn't a prime interest of SLHS - it's a huge specialist area in its own right. We provide a list of useful sites on our genealogy links page that will help you to begin your research, however if you have a specific query drop us a line! 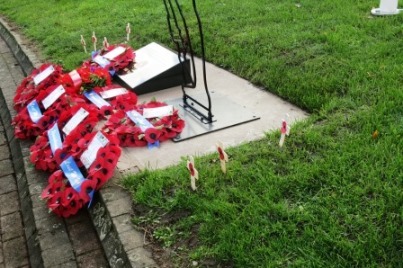 This brand new public war memorial was dedicated in time for the Remembrance Service in November 2018. Send an email naming the location. The 2018/2019 Programme promises another set of informative and stimulating talks from local experts. Returning favourites Ned Williams and Ian Bott will be covering chapels and Frederick Hackwood, an influential Black Country historian. In March the irrepressible Max Keen will appear in many guises to tell the story of Dudley Castle. Meetings take place at St. Andrew's Church on Bilston Street in Sedgely, and are scheduled for Sept/Oct/Nov 2018 and Jan/Feb/ Mar/May 2019. The society is very friendly and, as always, visitors will be most welcome. Contact the Sedgley Local History Society Webmaster for more information. We wish to respect copyright and be as accurate as possible - if you spot any inaccuracies, infringements or technical problems please let us know. SLHS and the site authors accept no liability for any errors or omissions. Copyright © SLHS 2003 - 2019.